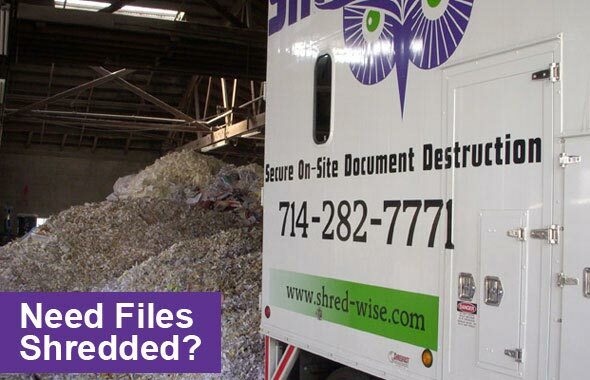 When Costa Mesa businesses and individuals need documents destroyed, they call Shred Wise Inc.. We offer safe and secure paper shredding at competitive rates with exceptional customer service. The quality of our shredding services has earned us thousands of satisfied clients and a reputation for providing the best value in Orange County for paper destruction services. We use state-of-the-art equipment, employ thoroughly screened staff, and abide by the strict standards set by NAID, the premier trade association for the shredding industry. Our services include both on-site and off-site shredding for one-time or recurring needs. We are compliant with all privacy laws, including HIPAA, FACTA, and GLBA, and always provide a Certificate of Destruction after we complete a shredding assignment. One of the main benefits of choosing Shred Wise over other shredding companies serving Costa Mesa is that we can afford to be more responsive and flexible. While most other mobile shredders come from northern LA County and serve all of Southern California, Shred Wise is located in Orange and concentrates the majority of our business in Orange County. This makes it easy for us to accommodate last-minute shredding requests in Costa Mesa without much hassle. It also means that for clients in Costa Mesa with a service agreement, we can stop to empty their containers if they get unexpectedly filled before their next scheduled service without having to charge extra fees. Shred Wise can be trusted to shred any paper documents or files, including bank statements, billing reports, blueprints, checks, classified and confidential information, consumer data, contracts, credit applications, credit card statements, employee records, financial reports, human resource files, intellectual property, invoices, job applications, junk mail, legal documents, medical/health records, receipts, student records, tax records, and more. In addition to paper documents, we can also ensure that your hard drives, cds, dvds, and select other media storage devices are properly destroyed. Shred Wise uses the PT-300 LE from ShredFast to provide its mobile shredding services in Costa Mesa. This mobile shredding truck uses sharp, heavy-duty rotating blades to piece through large quantities of paper and then tear it apart. It can shred more than 6,000 pounds of paper an hour and carry up to 17,000 pounds of paper when full. It features an onboard “shred cam” and an automatic curbside lift system for added security. To complement our secure trucks, we also have locked bins and consoles that satisfy HIPAA and other regulatory stipulations. These consoles and bins can be used by our clients at no additional cost. With Shred Wise, you can rest assured that 100% of your paper will be destroyed with our shredding services. Additionally, 100% of your paper will be recycled. 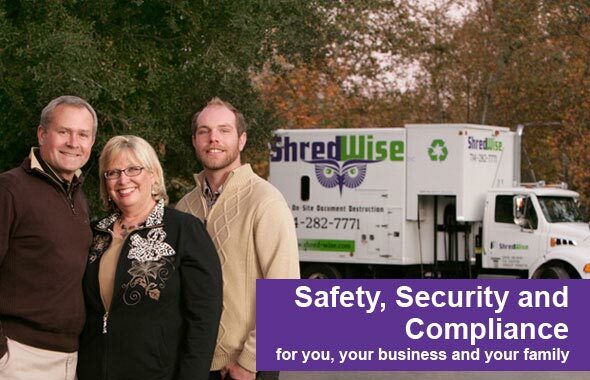 Shred Wise is a licensed, bonded, and insured paper shredding company with thousands of satisfied clients. We have an excellent reputation in Costa Mesa and throughout Orange County for delivering superior service at great rates, with no hidden fees and no long-term contracts. We are NAID (National Association for Information Destruction)-compliant and abide by their recommended best practices for document destruction. Call today for a free estimate over the phone or to schedule an on-site consultation in Costa Mesa. We are located at 3222 E. Chapman Avenue, Orange, California, and welcome calls or visits between 7am and 5:30pm, Monday through Saturday, or between 8am and 12pm on Sundays. 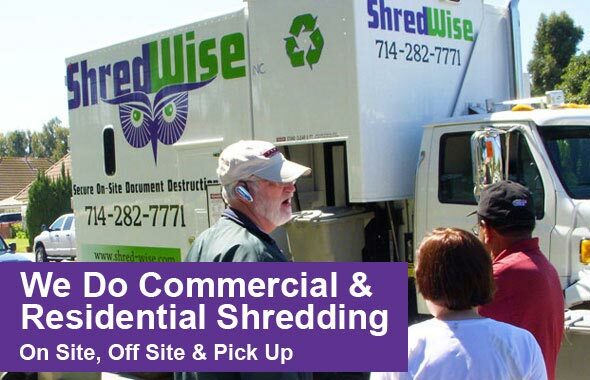 If your business requires ongoing, regularly scheduled shredding services, call Shred Wise Inc. We are a local shredding company with a large loyal following throughout Costa Mesa. Our on-going shredding services can be scheduled to take place weekly, bi-weekly, monthly, bimonthly, or quarterly. This service includes having a uniformed employee arrive in one of our secure shred trucks and go through your office to move paper from your locked consoles into a locked bin. All bins are then taken out to our shred truck, where the containers are lifted one by one using an automatic curbside lift system. The paper is then shredded using the pierce and tear method and mixed with hundreds (if not, thousands) of pounds of other destroyed paper inside the truck. You or a designated employee can observe the process with our shred cam or simply have us provide you with a Certificate of Destruction with your work order. Call today to schedule shredding services in Costa Mesa. There are no long term contracts, no hidden fees, and no complicated language — just a simple agreement that clarifies the frequency of our service; the use of our locked containers for free; and the 30 days of advance notice we require to discontinue service. Shred Wise Inc. handles helps businesses and individuals who wish to purge large quantities of sensitive documents and files in Costa Mesa on an as-needed basis. Whether you have a business that is preparing for its annual records purging process, or you are an individual that needs to declutter your home, you can give us a call to schedule on-site or off-site shredding services. We’ll find a three-hour window on a day that is convenient for you, and then arrive within that agreed-upon timeframe. For your security, we can provide you with locked shred bins for you to fill, or you can simply bring your boxes of files and paper curbside and we’ll shred your documents right in front of you. For those with hundreds of boxes to shred, it may make more sense to have your documents shred off-site. For off-site shredding, we arrive with a panel truck, load all your boxes into our truck, and then lock it before transporting them to our facility in Orange. Your documents will be shredded according to NAID’s strict standards for secure document destruction and will then be taken to a recycling facility. We always provide a Certificate of Destruction once the destruction is complete. As with on-site shredding, you are welcome to witness the destruction of your documents. Call today to schedule a one-time purge of your documents and files in Costa Mesa. On-site shredding involves us driving our secure shredding truck out to our clients’ homes or businesses in Costa Mesa, picking up their documents, loading them curbside into the truck, and immediately shredding them on site. Clients are welcome to watch the destruction process in person and can even view the shredder using our “shred cam”. Once we are done, we provide a Certificate of Destruction, and then transport all shredded paper to a secure recycling facility where the paper is used to make new paper products. With every on-site/mobile shredding job in Costa Mesa, we guarantee that all documents will be 100% destroyed and then recycled. Our on-site shredding service is not only compliant with privacy laws, but also highly affordable and convenient. Call today for a free quote. Our off-site shredding services in Costa Mesa are a great option for businesses as well as individuals that have stored their paper to be shredded in an area that is not accessible to our shredding trucks, such as areas with low hanging trees or without adequate parking in a flat area so our truck can shred optimally. In these cases we will bring a truck out to your location and pick up your paper to be shredded and transport it back to our facility in Orange, California locked and secured inside one of our trucks. As soon as we return to our facility, we proceed with shredding your documents. We issue you a Certificate of Destruction. Call today to learn more or to schedule off-site shredding services in Costa Mesa.